NK: Yes, but I feel it is still important to acknowledge our position as outsiders and as perhaps more objective, detached viewers. LB kind of became our introduction to the city whereas in Karachi it was more of a re-introduction, and from what I can tell, it is probably the same with LB for them. Public art is also present in a more real sense in LB, I feel, and the spaces have been used with a more profound understanding of their essence and history, while perhaps video and performance art was a larger focus in Karachi. And this might be perhaps because of more government support for the Lahore Biennale. 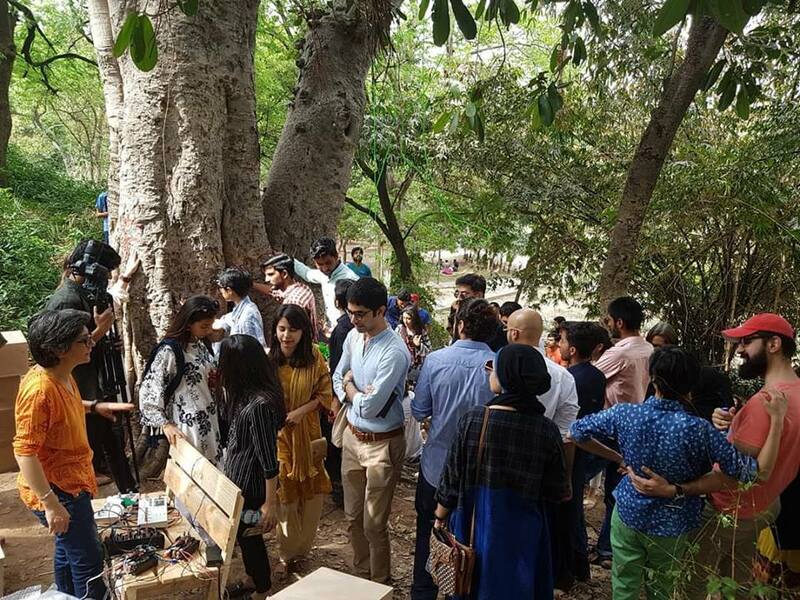 Although the Awami Art Collective’s piece experienced a lot of hiccups, it still brought art right out on the streets and posed the Canal Road as a venue, something which I really missed in the Karachi Biennale despite its emphasis on ‘public art’. Do you think the Lahore Biennale achieved this “for the public” thing more than the Karachi Biennale did? NK: I suppose in that way more than bringing art to the public it was bringing the art community to these public spaces. Even with KB, the public who doesn’t normally look at art, still didn’t look at art. So the same with Lahore; I probably wouldn’t go to all these places, but it forced me to do just that. So in that way such an event reintroduces these places to us, or revitalizes them. JA: Another good thing about this biennale, like its predecessor was the fact that it was so spread out. 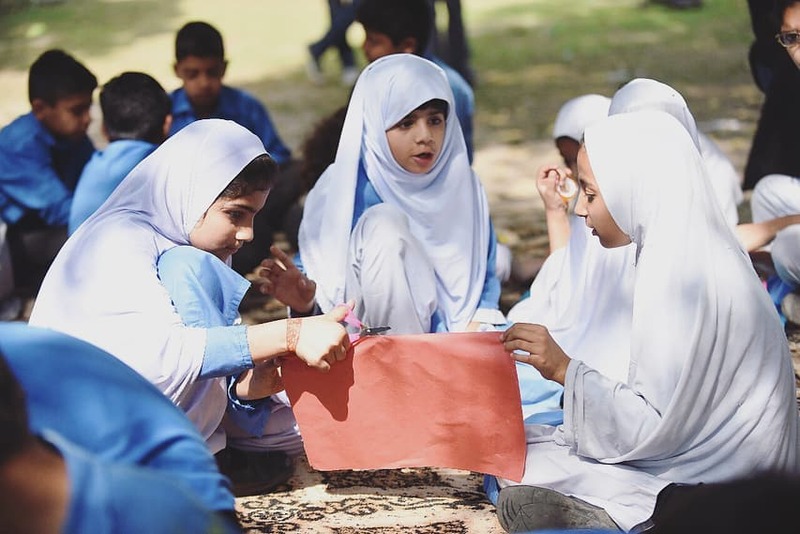 And in public places like the Bagh-e-Jinnah, it forced people to interact with the work as it was big, bright and inviting, like Noor Ali Chagani’s and even Wardha Shabbir’s pieces were great ways to attract the public along with having bilingual signs with information pertaining to the work. 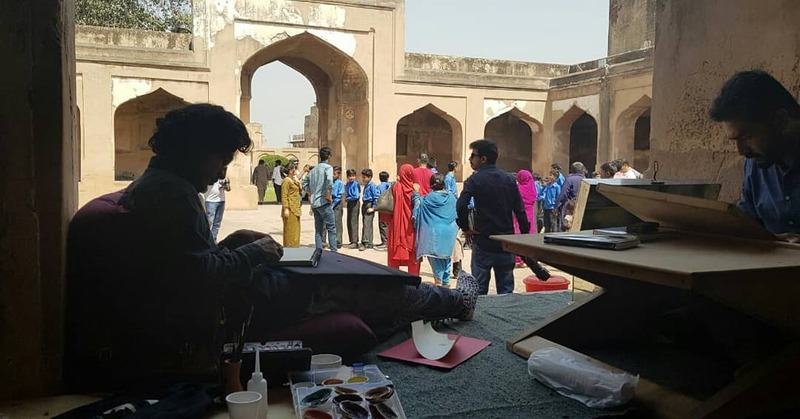 Also, using venues in and around the Walled City, the heart of Lahore, guaranteed an interaction between art and the local public at some place or the other and since this is one of the first of its kind, I think it did its job in beginning the conversation on art with the locals. When people start finding out about it they are likely to anticipate the next one. NK: So what did you think of the actual pieces at Bagh e Jinnah? JA: Definitely the works by Mehreen Murtaza and Ali Kazim were notable as they effortlessly blended into the site. Murtaza’s installation allowed the audience to listen to the sounds of the tree, and I noticed how easily the sounds changed when people touched it or moved away. 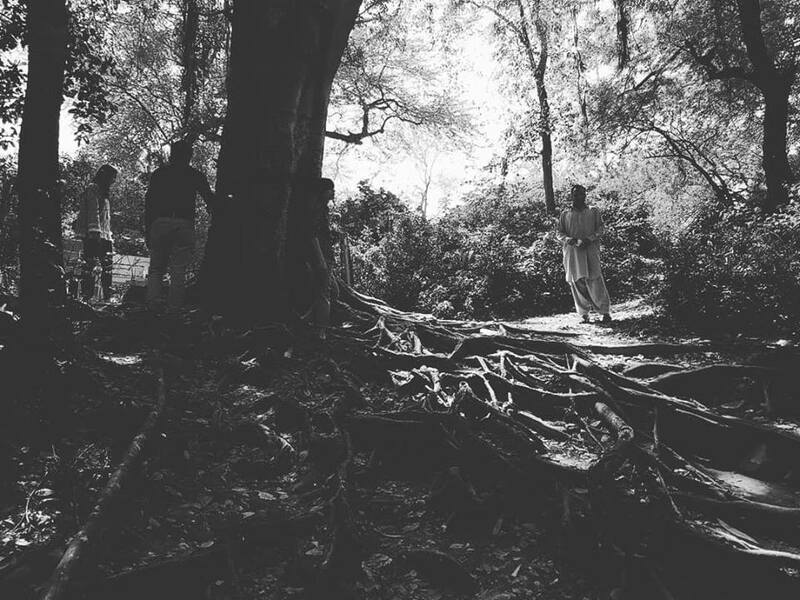 Kazim’s work forced us to explore the park, which was an added bonus, but the installation itself was beautiful. 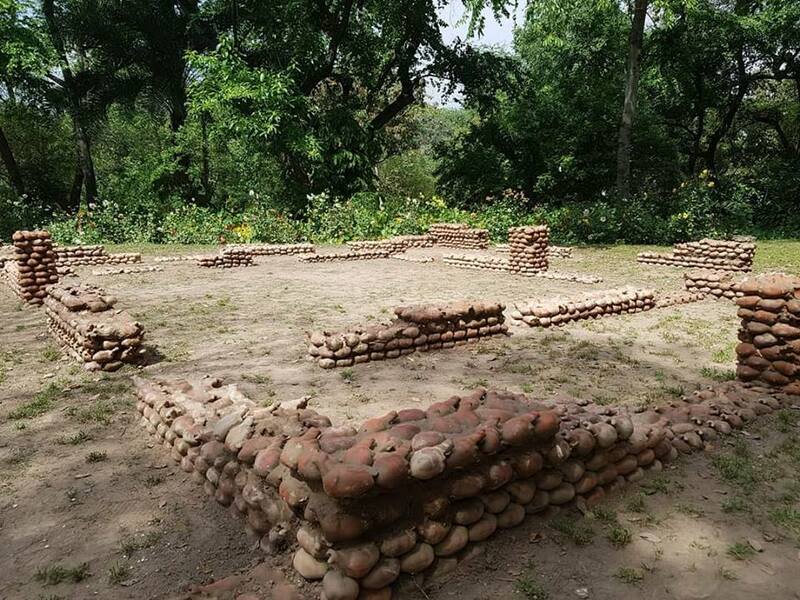 Inspired by the novel, Raja Gidh where this park was depicted as a safe haven for lovers, his terracotta hearts lined up to create mysterious ruins; an ode to the secret rendezvous this park has seen. The isolated location became a reminder of the solace one would find in such a beautiful park, away from the hustle and bustle of the surrounding city. NK: I love the idea of being able to converse with a tree, kind of a proof of life in a way. It makes one realize how we treat nature as an ornament and are passive towards it, but this kind of gives us a new way of experiencing it, as a living breathing organism. I also really liked Chagani’s piece, the whole idea of the geometric and the organic coming together within a space that represents organic aesthetics. This sense of disrupting the rigidity of a brick wall and making it more fluid is intriguing. 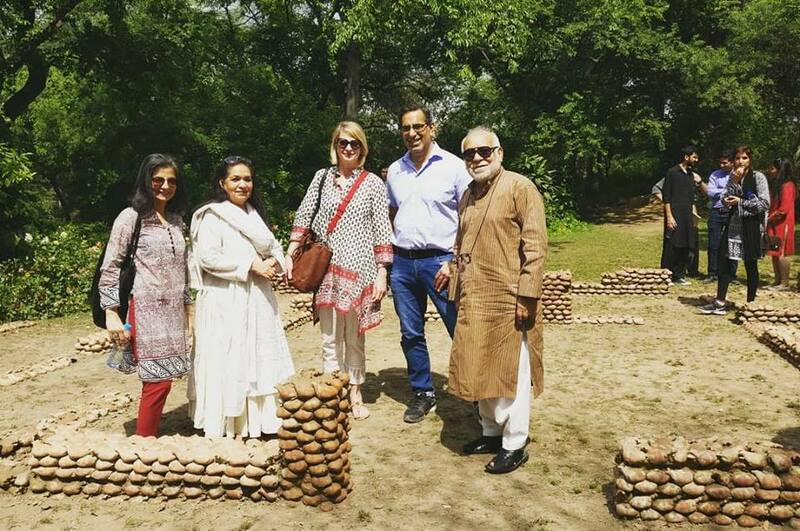 I also liked the fact that it was red bricks, which I kind of associate with traditional Lahore architecture, especially in the Walled City. JA: Yes, which is why it’s great that they also used some of these historic sites in the Walled City as venues, like the Shahi Hammam, which had been done up recently, so that was nice to see. Entering a space like this, you could appreciate the role the government has been playing in preservation of heritage, which is sadly amiss in Karachi. Walking into the venue, the first thing you notice from all three artists is the perfect blend of colour with the venue. This coupled with the casual placement of the art and the dim lighting created an impression of an excavated site, with the contemporary pieces as just an extension of the historic space. The reds, though bright, created an interesting contrast but then again, it wasn’t unsettling to the eye. NK: I found Aisha Khalid’s work to be particularly pertinent to the space, specifically these pieces in the wall arches where she intervened into the faded decorative paintings by filling in the cracks with her iconic cultural motifs and patterns. So she filled in gaps in history almost, yet not creating a cohesive picture. I also thought her intervention with the large mirror on the floor was quite a profound commentary on the erasure of heritage, with the mirror acting as an artificial stand-in for the water that was once stored here. The orange lines present in both works add to the commentary on the growing modern infrastructure that overpowers and devalues tradition and heritage. JA: I personally enjoyed Manisha Gera Baswani’s piece, particularly because I got to see her process work while I was in university. Now looking at the final product was wonderful. She had visited studios of artists in India and Pakistan and clicked 47 portraits (the year of Partition) that best suited their personality. These in turn were made into postcards titled, ‘Postcards from Home’, with personal anecdotes by each artist from before the partition written behind their postcard. This alluded to ideas of displacement and nostalgia and sought to bridge the divide through a common history. This was one of the very few interactive pieces at the biennale. It had no preciousness about it but in fact invited its audience to collect the cards. I myself, collected almost all of them. JA: And because it was the opening, some, like R.M Naeem’s, were finished, so I quickly snuck a damaged one lying on the floor. This showed how successful this installation was as it seemed to rekindle the intrigue of the past with every card that was picked up. NK: And she even had envelopes there so that also invited you to make a collection of these iconic artists, instead of just picking one or two up. 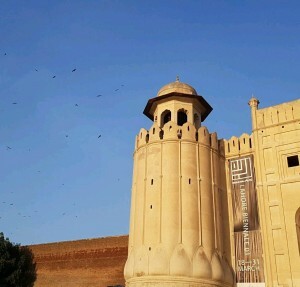 JA: Another historically charged venue in the Walled City was the Lahore Fort. 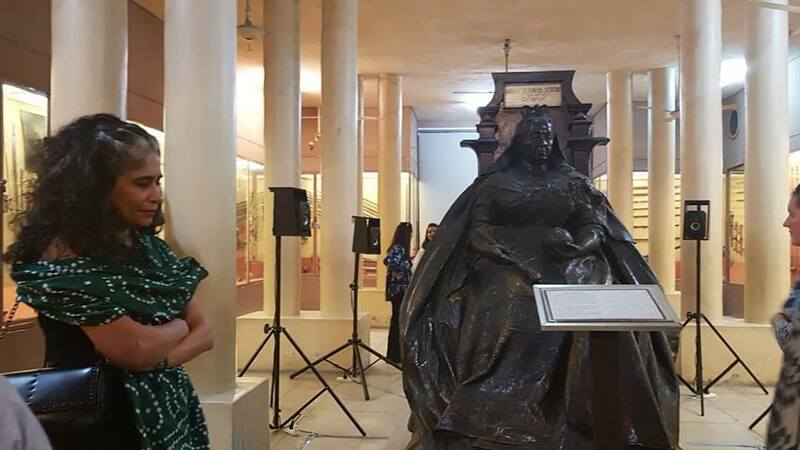 Again, I generally really liked how the space was used, both visually and conceptually, with pieces displayed in glass cases like in a museum – Rehana Mangi, Fazal Rizvi, Sadia Salim – which went with the idea of the space as a heritage site. 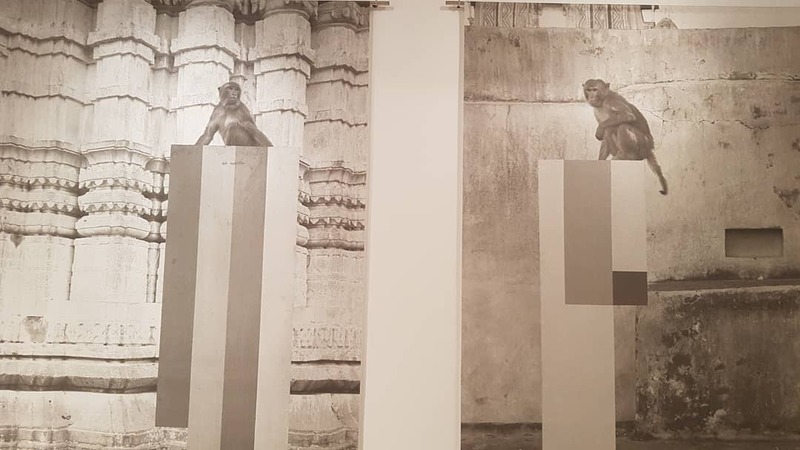 These pieces were also commenting on historical perspectives, with Rizvi grappling with ideas of post-colonialism, identity and politics using the Bengal Tigers and archival images of tiger hunts in colonial India. Salim looked at the geometric and ornamental decorations on wedding cards through the delicate porcelain, while Mangi discussed the ideas of fallen hair and how it becomes a symbol for unattainable and discarded desires, much like loose strands are thrown away. It did not feel forced because these artists have used displays and concepts like these in the past, and had the kind of delicate work that needed such covering. NK: Naiza Khan also contextualizes her geographical and urbane narratives through history in her video installation “The Observatory”, so it was conversing with the space quite nicely. 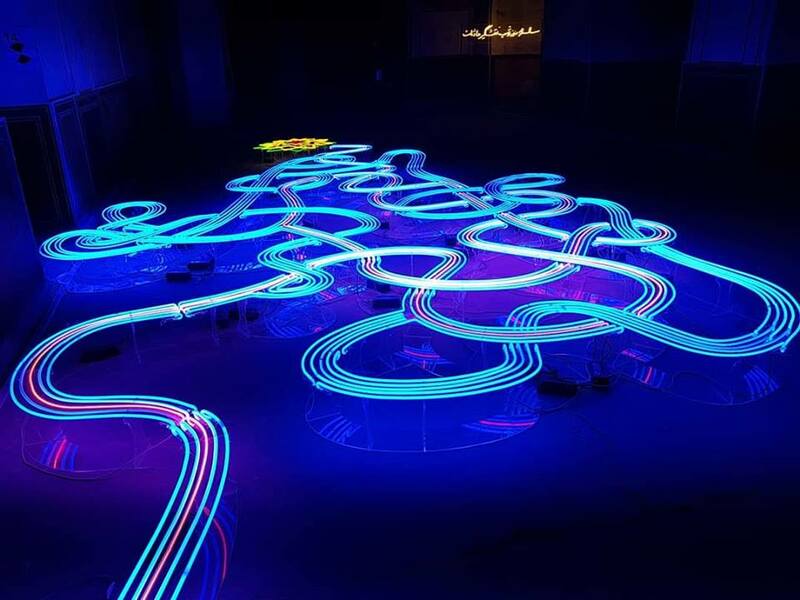 JA: Other works created a different kind of dialogue with the space with contemporary juxtapositions, such as the sprawling neon piece by Iftikhar Dadi and Elizabeth Dadi, which is a contemporary iteration of the historical space and other architectural themes of the Mughal era like there fascination with maze-like structures, and reacts to the displacement of time in the darkened underground palace. I only wished there was a way to view it from the top, although it was nice following it through the room like a river. 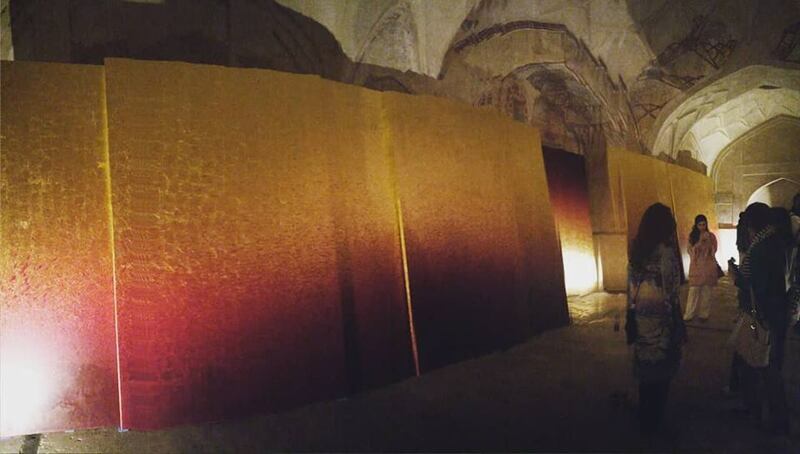 NK: Imran Qureshi’s piece was also something that was instantly captivating, kind of creating an alien landscape. The field of optic fibers glowing in the darkness, and reflecting endlessly in the mirror walls, was commenting on the artificiality of the digital age, set against the dilapidating architecture of the Mughal age to talk about this shift in aesthetics and value systems and disappearance of the “handmade”. His other project with the Aga Khan Museum, NCA, Lahore Fort and the Walled City Authority, ‘Maktab’, was also a novel idea. Our experience wasn’t exactly the best because of electricity issues, but the idea of it was to honour the Mughal tradition of miniature artists working collaboratively, bringing together young artists to create artworks throughout the course of the biennale. This was a way of reconciling contemporary practice and traditional process. JA: Maktab is the Arabic word for school which made me realise how effective that installation was. Having 24 NCA graduates of different years, sit in the space and create a miniature inspired work fabricates a story for the audience. A window into the past, but also questioning the idea of contemporary miniature. Does sitting in this space make them the same as the masters before, when the paper and tools, even imagery used aren’t the same? But then also, their work was a response to their time and context much like the original painters. 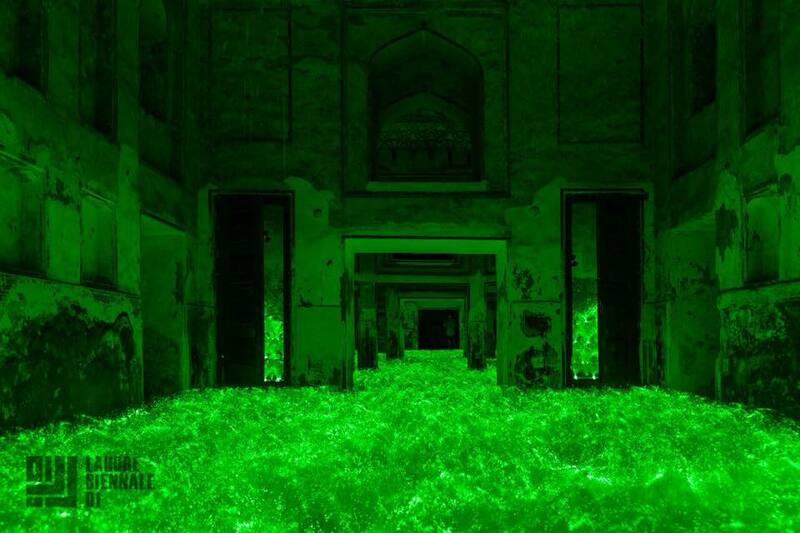 Another work at the Lahore Fort, a video and performance piece by Shahzia Sikandar, “Disruption as Rapture”, worked with similar notions of interpreting the tradition of miniature in a contemporary context. It was inspired by the 18th century poem Gulshan-i-Ishq that spoke about the connection and longing of two lovers. Using this story as a metaphor for a soul searching the divine, the work also has a lyrical component that was done in collaboration with Pulitzer prize-winning composer, Du Yun and singer Ali Sethi. 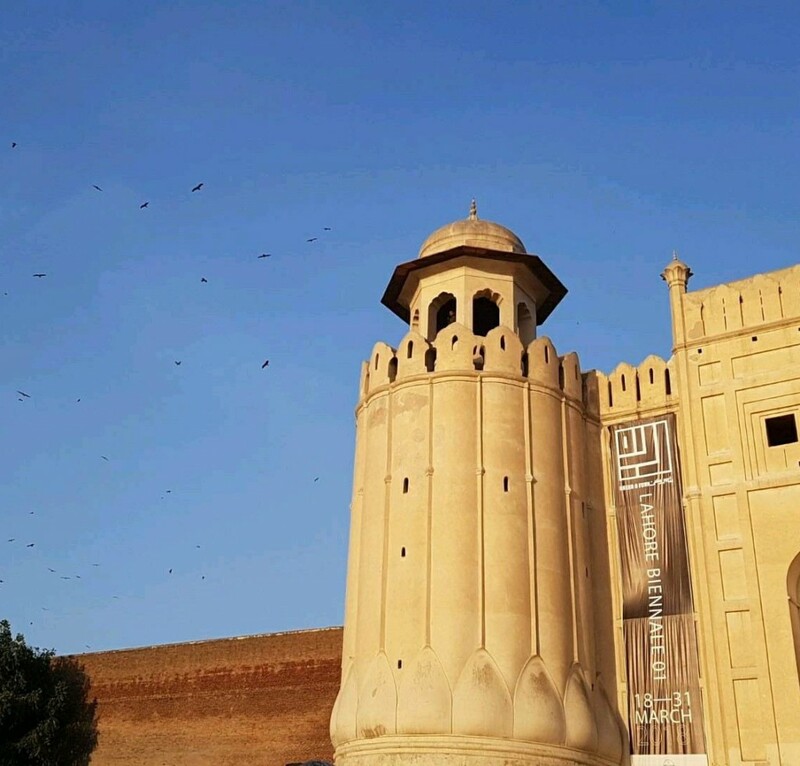 The good thing about the installation at the Lahore Fort was that it was outside as opposed to videos usually kept indoors for darkness and protection. This could be appreciated by more people and against the backdrop of an era from which these visuals were inspired from. 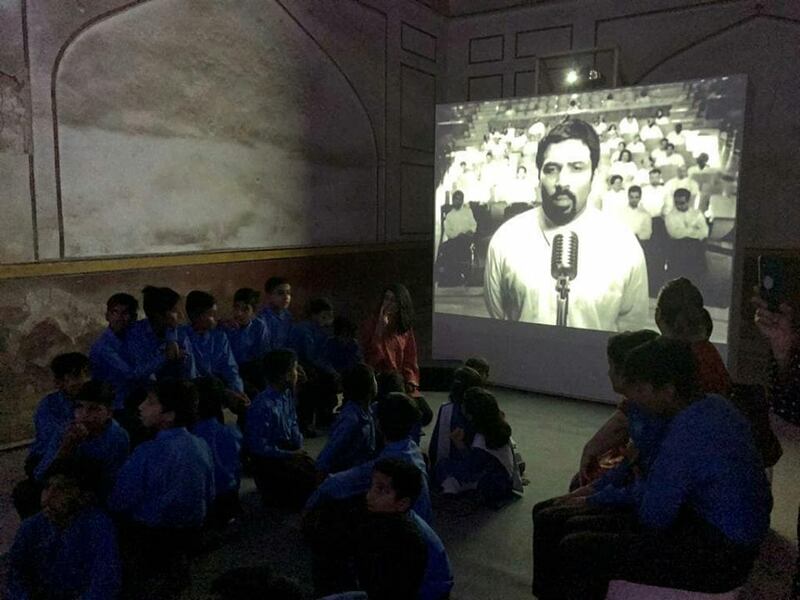 Also, the idea of having a collaboration with a well-known Pakistani singer as part of the biennale was exciting to see, and to have a local choir sing with them was important as it meant they were engaging with the community of Lahore …. NK: It was also great that this video was later installed in the gardens of Alhamra Arts Council, so it could be viewed all day, and was visually complimented by the landscape of the garden. 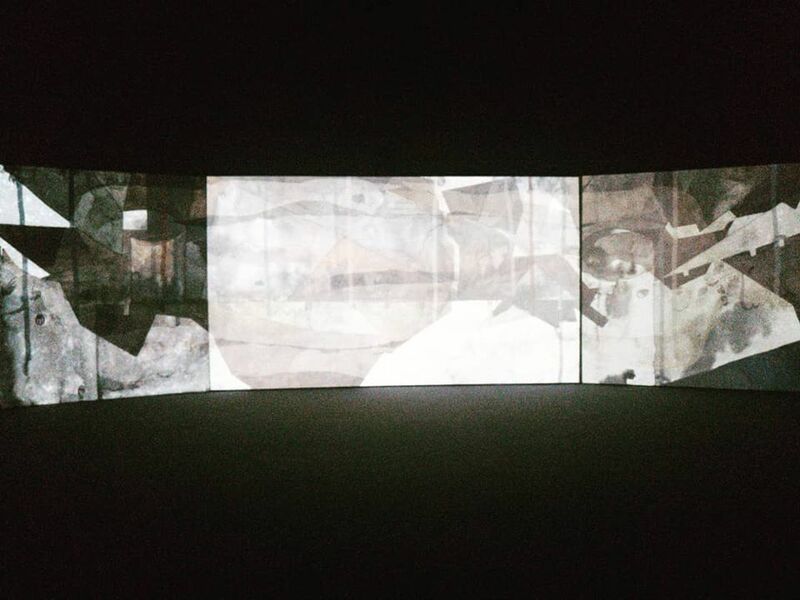 It was also exciting to see her other work, “Parallax”, a multichannel video installation presented as a curved longitudinal projection comprising multiple overlapping animations. The commentary on history and post-colonialism is evident, but I also love the interplay of the abstract, the representational and the surreal, which makes it a visceral experience despite the process probably being quite cerebral and contemplative. When I think of the rest of the displays at Alhamra, I feel a second visit really paid off, considering our first experience wasn’t that great, mostly because despite being a preview, the setup was incomplete. I thought the pieces there were very strong but the element of playing with the space wasn’t present as much as at the other venues. NK: I suppose… It was interesting to have those pieces displayed there because the works themselves were strong and kind of gained centre stage in a gallery setting. I especially really liked Naima Dadabhoy’s idea of bringing her studio process into the gallery in these clinical petri dishes and glass jars. 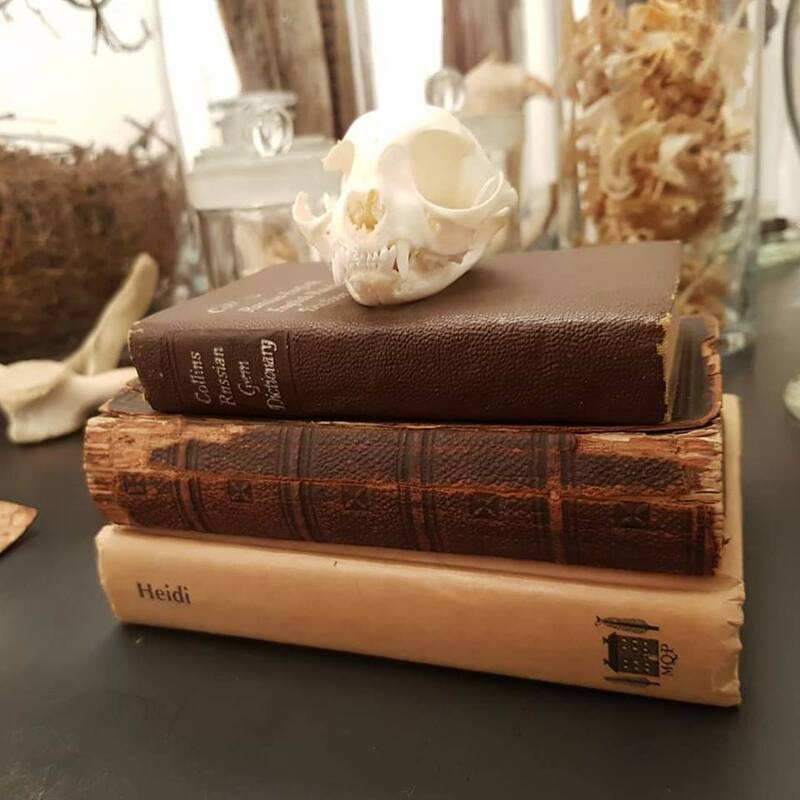 She collects objects that in a way signify death, and grows fungi to look at the process of decay, commenting on the inevitability of death and eventual disintegration of life and allowing the audience to come to terms with their own mortality. JA: I couldn’t stop staring at Kay Walkowiak’s large photographs on fabric title ‘Rituals of Resistance’. The shapes were interesting because I couldn’t tell if they were plinths that existed in the actual space or digitally added artefacts. It looked like glitches or pixelations or flat shades used to censor. But it could also be an architectural structure, and it was an effective play of pre and post colonisation and kind of depicted a timeless utopia. NK: And the fact that it was in black and white made it more ambiguous and the lowered contrast somehow brought out the contrast between the detailed traditional architecture of the surroundings and the flatness of the minimalist, modern structure. There was this idea of conquering and erasure of the past by the technological, digital future by man, who can be equated to the clueless monkey sitting atop his kingdom. JA: I found the placement of the videos at Alhamra effective, especially the ones projected. 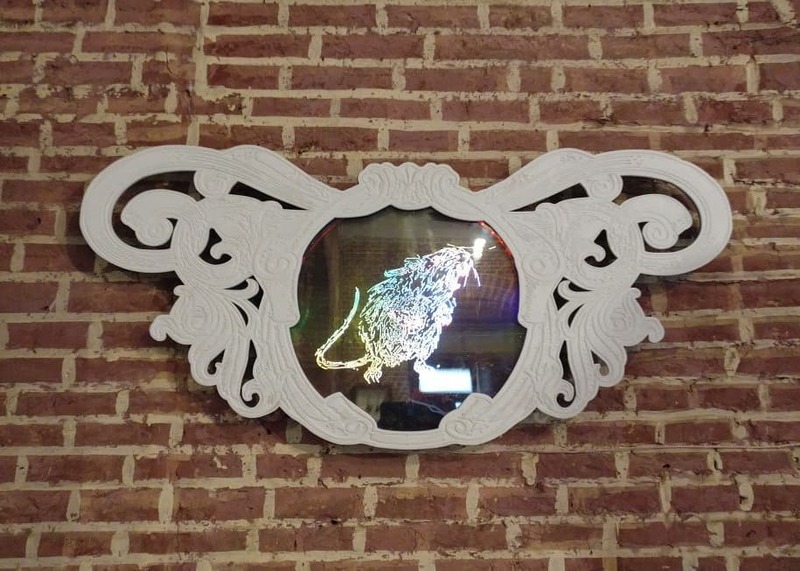 I was particularly intrigued by the video ‘ Wonderland’ of the Turkish artist, Halil Altindere. Made in the form of a rap video by a hip-hop group from the Sulukule neighbourhood in Istanbul. Demolition in the area began in 2006 as part of Urban Renewal, but the homes have not been rebuilt, and instead left the occupants in dismay and poverty. The video shows the thriving of music culture against hardship and continuous rundown with the police. It also becomes an apt example of creating art for the public without diluting its essence. The fact that was made like a music video invited people to come, sit and watch but when reading the subtitles, you realize the seriousness of the situation. Music is truly a universal language and its usage here allowed a serious message to spread to a wider audience. NK: You know, now that we’re discussing each piece, I see the connection between all the works at the Alhamra. They are about the city, and have this underlying social commentary specific to urban space. There is a focus of histories, politics, and social dynamics of the urbane.. We can see this in Naila Mahmood’s work, where she explores the issues related to urban density through inner city kitchens in Karachi, and in Walkowiak’s engagement with the metropolis of Hong Kong as well. JA: And then Salman Toor is talking about his linkage between Brooklyn and Lahore and a resistance of both societal norms. His work reveals class anxieties, and contrasting and hybridizing cultures, while Seema Nusrat comments on the changing architecture of Karachi as evidence of its political realities expressed through increased policing and control in the name of security. NK: it’s clear that the works were carefully picked out and put together with its focus on urbanity and its issues in a space associated with art and culture and located within the newer city. 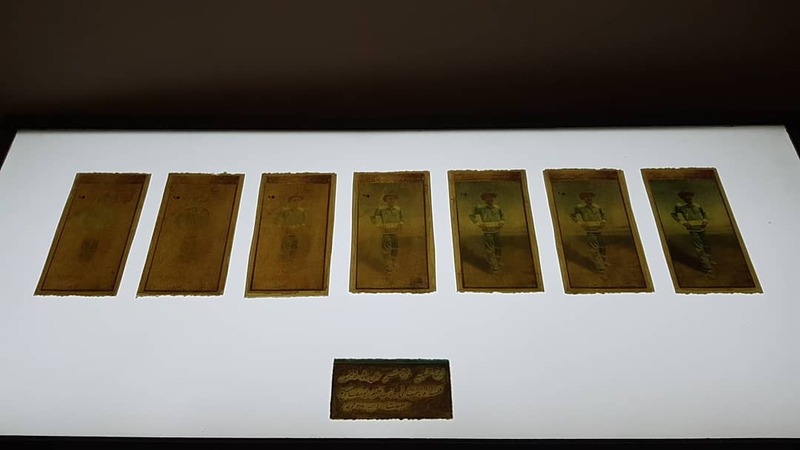 JA: In that way the Lahore Museum is also a traditional display space but to have contemporary artworks within display cases interspersed with museum displays kind of created a window into the future; one day what we regard as contemporary will be part of the same historic collection. One great example is Masooma Syed, whose hair sculptures tell a story of a fictional perfume maker who lived to be 134 years and occasionally made these drawings from commoners. Syed created a space where time is of no concern, a space where a living artist tells the tale of a dead fictional one, in a space where only the past has resided until now. NK: I also thought Bani Abidi’s piece was one of the strongest ones, and one of my favourites. This work was originally installed at the Edinburgh Art Festival in an abandoned debating chamber and is kind of a memorial to more than a million Indian soldiers who lost their lives fighting for the British Raj in the Great War, but are never remembered. Their supressed anti-war sentiments are finally given voice, and with its installation around the statue of Queen Victoria and amongst displays of antique articles of war, the work reached a kind of catharsis that added layers of depth and profundity to its narrative. I feel there isn’t a more perfect location where it could have been recreated. JA: And then in the Mubarak Haveli, I was most amazed to see Lala Rukh’s work in person, something I had only seen online before. This was another important aspect of the event that it allowed us to experience works of such great names and finally even meet some of them in person, like Imran Qureshi. Even hearing Shahzia Sikandar speak was a delight. 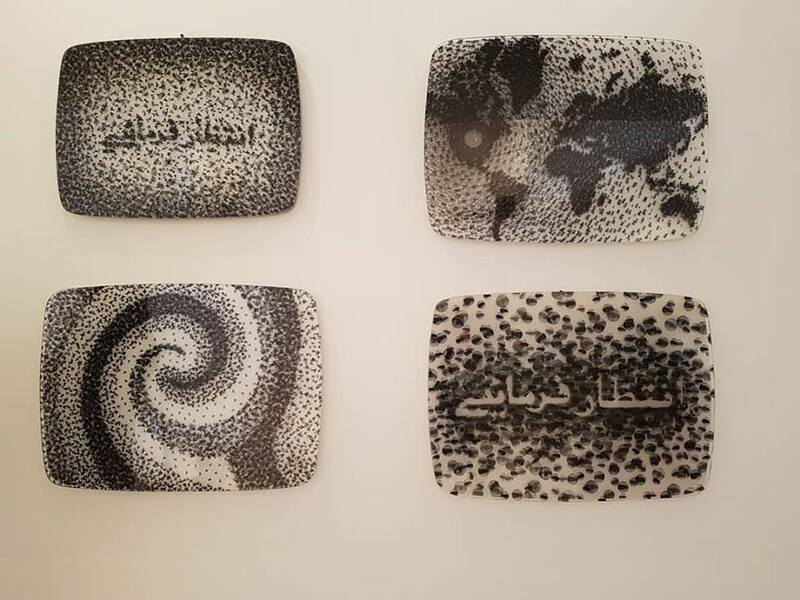 Aisha Khalid’s display made sense there because the ‘Name Class Subject’ series were painted school books which really went with the Naqsh School of Arts and related to it personally and atmospherically. Ayesha Sultana brought her architectural drawings to life through minimalist drawings which were also a treat to witness. N: But for some reason I liked the collateral show at Fakir Khana Museum, ‘I, too, am a part of this history’, more than the Haveli. I loved the rustic old building and its old-world charm; the way the display of the works was handled kind of brought the space into the present and enhanced both. JA: The curation of this show was, in my opinion, the most successful from all the collateral events. I quite enjoyed the space in itself just as much as the venue. The artists here really responded to the space. I enjoyed Suleman Khilji’s play with building material, light and drawing as well as Mohsin Shafi’s unusually placed video on the roof that bore harsh truths about artists that we tend to hide. Hurmat ul Ain’s and Rabeyya Naseer’s video spoke of realities of the past that are instilled and relatable, especially to women, to this day. NK: It actually makes one question why this collateral show was a collateral, and not just a venue for the LB, which it could’ve easily been, especially with the kind of location and space it was. So which of the venues were your favourite? JA: Weirdly enough it was not a venue at all, it was the collateral show at Fakir Khana Museum. The way the space had been used and how it took you through this part of history with the works kind of assimilated into it; it was really well curated. Also, that it is a museum and open to the public was very important. They have some of the oldest ivory miniatures which are worth seeing. NK: I suppose there must have been logistical issues, especially with it also being a residence of the family that owns it, which is why it was probably not used as a venue. Mine was, I think, Bagh e Jinnah. The works over there were very well picked and kind of responded to the space really well, especially Murtaza, Chagani, and Kazim’s, keeping not only the environment but its curious colonial history in mind. The only thing is, I wish there were more pieces there. I feel it was underutilized. A close second was the Summer Palace in the ways it initiated various conversations between the space and the works. I generally really liked the way the biennale has chosen and used all its venues. As a whole if you look at the venues chosen, it seems to create a conversation around, about, and with Lahore. They were able to represent Lahore very successfully and capture its essence, at least for me as an outsider. Everything that I relate Lahore with – natural beauty, historic sites, modern city, cultural center –from the Lahore Fort to Bagh e Jinnah and Alhamra, you’ve got all sides of the city represented and that is where the success of the biennale lies, in my opinion. JA: Being spread out across the city also made it quite successful. 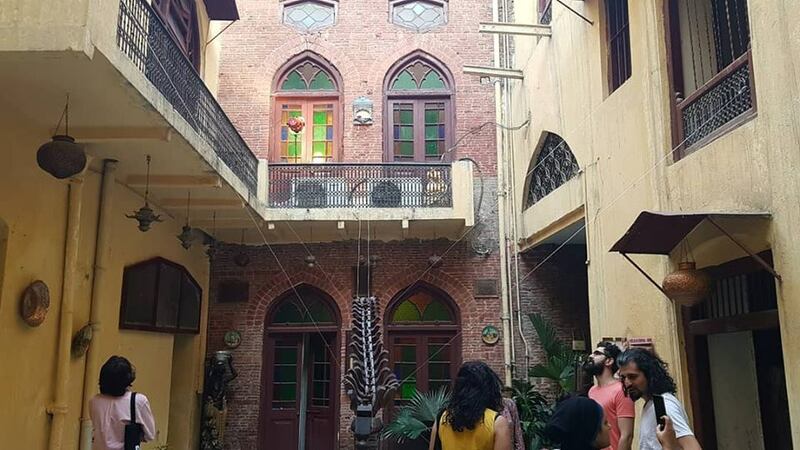 Those religiously following the biennale got the opportunity to explore Lahore while searching for the venues, and again there was a chance that a large number of the public at least saw a few works, if not all. 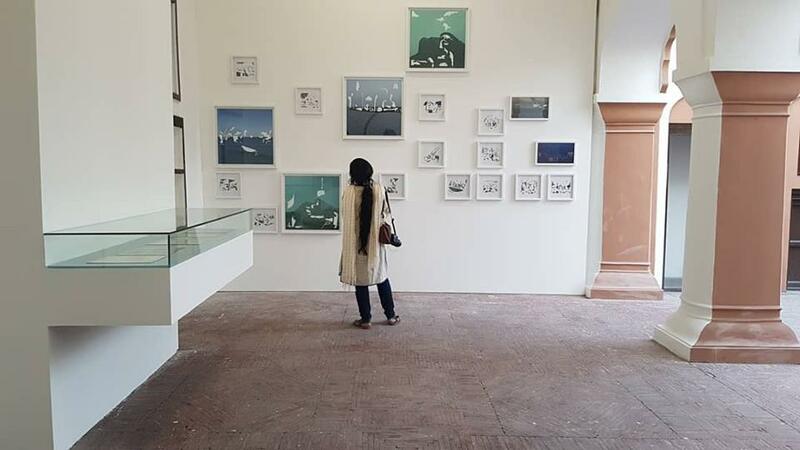 The Lahore Biennale ran from 18th March till 31st March across 7 venues in Lahore. Well done Jovita Alvares and Nimra Khan.